Following the definition of the different shoppers, let’s take a look at one of the biggest reason a user might get an application. Reviews. Having a product, or application reviewed is highly important as it allows the users to have a insight or an idea of exactly how it works or what it does. It allows users to make an informed decision of your offerings over that of the competition. So how much does reviews matter? Recommendation from friends or family members made up 81% of the consumers. BlackBerry recommends that the application should include the ability to share contents or milestones (for games) on social media. 75% of the consumers, on the other hand, would download if it was featured on a blog or publication, especially if it was a positive review. 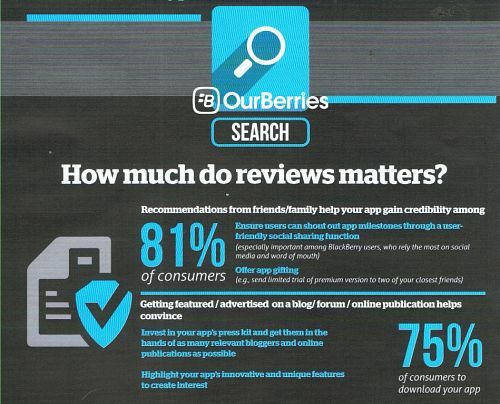 So how much does reviews and exposure matters? A lot. But, that is not all. So here’s another question: Why is on app chosen over another? Look out for our next installment for the answer!